Has anyone else had a microphonic noise when you tap on a volume or tone control? My Schecter has all BKP components, 550K CTS pots with Jensen capacitor, CRL 3-way switch, and Black Hawk pickup set. Might it just be the wiring? The pots seem to have some movement and loud knocking noise can be heard through the amp when you touch the knobs. I'm, not sure if it is both volume and tone or just volume. I am mainly noticing it with the volume knob. 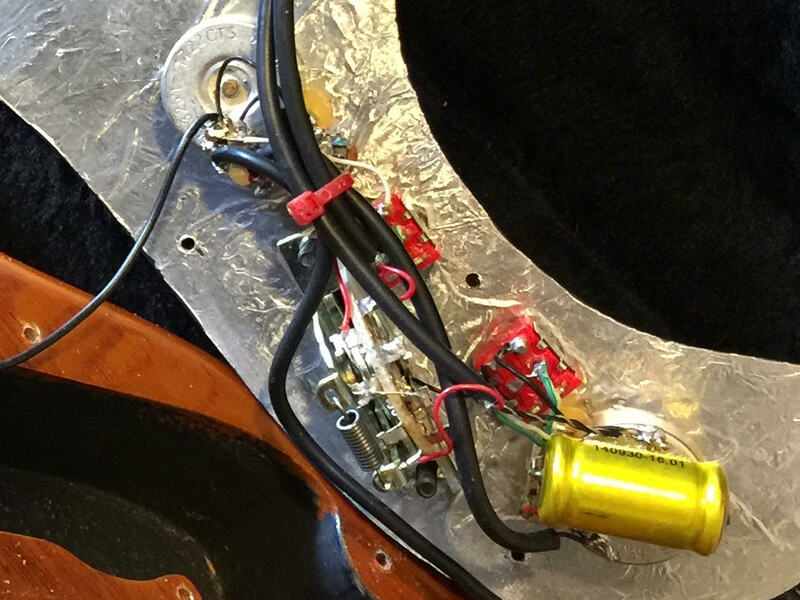 I get a similar sort of effect with my Fender Tele Custom FMT and with that guitar it's due to the chambered construction of the guitar itself which makes it microphonic to any knock on the body, pots or selector switch. How did you deal with it? Did you put tissue or foam in the cavity? It's no big deal - I don't really change pickups mid-song, so it's not a huge problem. I've also only used that guitar for live playing a couple of times and I can't remember it being a problem then either.